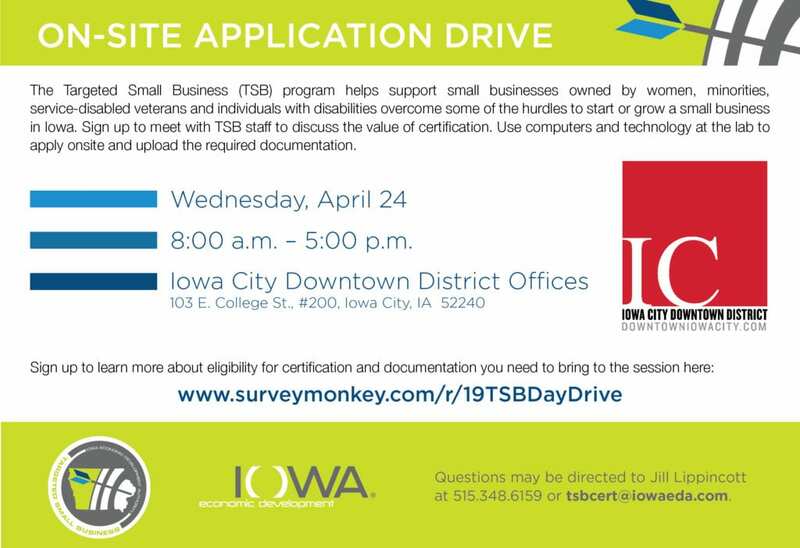 The Iowa City Downtown District is working with the state of Iowa to host an all-day certification event for women-owned businesses in Downtown Iowa City. Currently, there is only 1 woman-owned business that is certified, listed and recognized by the State of Iowa in the Targeted Small Business program. Our hope is to get as many women-owned businesses certified and a full list put together for the ICDD. This all-day certification will be an opportunity for any business that is 51% woman-owned to come to the ICDD office and ICDD staff or state staff submit an application on their behalf. We’ve made it easy and simple, each business should only need about 30 minutes to provide all information and have the application submitted. This will be the first time a downtown area has worked to certify a large number of women-owned businesses in a specific area, which will be used as a big promotion for the state and the ICDD. We will be hosting an informal Happy Hour the night before the certification even, on April 23rd at MERGE from 5:30-6:30pm for anyone who wants to network. ask questions or just enjoy a drink.